It is a shock to many people that yes, apples can be grown in a tropical climate, and have been grown by the millions for decades. This goes against the conventional wisdom that apples need between 800-1,000 hours below 7° C. (45° F.) in order to break dormancy and set fruit. But experience has shown that using tropic apple culture methods can fool the tree into thinking that it's chilling-hour needs- whatever they may be- have been satisfied and it will then blossom and fruit. You still must be choosy about which varieties to plant, and the tree will act much different than in a cold climate, but the end result is crisp, juicy, tasty apples. It was then assumed that apples could be grown only in the highland tropic areas that receive quite a bit of cold weather, but not down in the lowlands with the heat and humidity. However a three-year study¹ in Nigeria and Southwest Cameroon proved that this was wrong. In that study 18 localities in Nigeria and 8 in Southwest Cameroon comprising both cool highlands and hot tropic lowlands were selected and planted with the apple variety Anna and a pollinator. 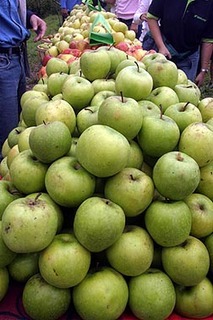 Several different cultural methods such as planting density and irrigation were employed at each location and an evaluation of the fruit pack-out was done at the completion. Researchers were surprised to find that some of the warmer lowland areas produced well, and the limiting factor was not temperature, but excessive rainfall. Heavy rains during blossoming prevented pollinating insects from flying, knocked the flower petals and young fruitlets off the tree, and led to problems with foliar disease such as powdery mildew and scab. Better results were obtained with areas with less rainfall but with the potential for irrigation. 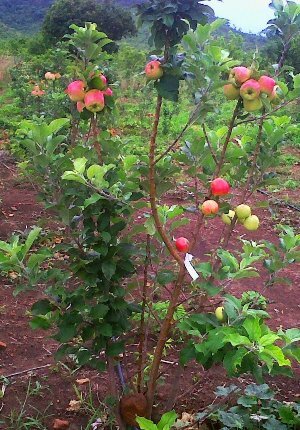 So come and explore the world of tropic apple growing. You can learn much more through our book and monthly seminars on tropic apple culture.